Affiliate marketing should play a significant role in any successful e-tailers marketing strategy; however it remains an often overlooked channel of sales. In essence affiliate marketing is the practice in which a merchant rewards an affiliate for their marketing efforts in achieving a predetermined goal (be this a sale or a lead). In driving traffic from an affiliate’s website to the merchant’s website a definite overlap with other Internet marketing activities becomes apparent. 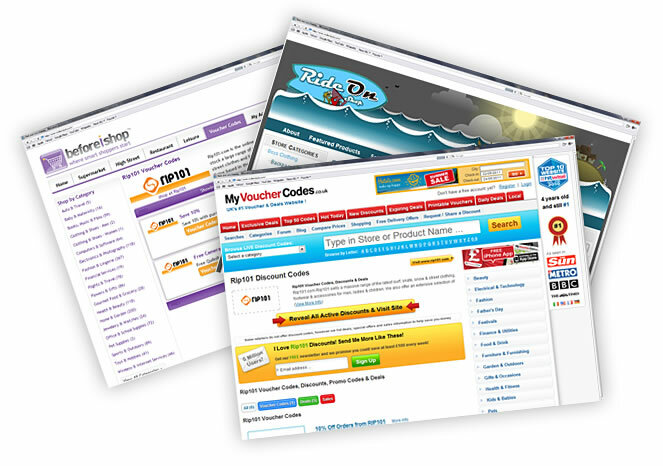 For example affiliates often use techniques such as SEO, PPC advertising, Email marketing or product reviews to drive traffic and sales to a merchants website. I have several years experience with affiliate marketing from the initial set up stage to working closely with individual high worth affiliates on bespoke marketing campaigns and have an extensive knowledge of the Webgains, Affiliate Window and TradeDoubler affiliate networks. If you would like to set up an affiliate programme or are looking for help or advice on managing an affiliate programme, please get in touch, I’d be happy to discuss your requirements. Please see examples of my affiliate marketing work below. Having set up the RIP101 affiliate marketing program from scratch I was instrumental in selecting the appropriate affiliate network for the products sold at RIP101. Once the program was live I was responsible for promoting the program and recruiting new affiliates as well as communicating en mass to all affiliates on a regular basis with latest updates and offers. In addition to this I worked closely and formed strong working relationships with specific high performing affiliates and created bespoke campaigns. Click on the image above or here for further information about the RIP101 website. If you are looking for help or advice on getting involved in affiliate marketing or affiliate programme management, please get in touch, I’d be happy to discuss your requirements.